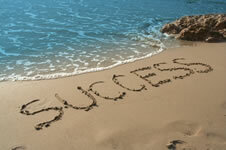 Welcome to Success – YOURS! ...But first you have to read this web page - boom boom! Actually, and somewhat seriously, you will find links to principles, laws, quotes, articles, recipes, secrets - all to do with this fabled S-word. You'll find the F-word, fear, being discussed too. So let's get going, eh! Oh, and if you're at all interested in home-based-business success (and you might!) - it's discussed too! "Finished! Er, are you sure the tide's not coming in?..." Even though the SelfHelpCollective.com website is only 3 and half years old (at time of writing) - site was conceived in Feb 2008, and the first pages went live in May 2008 - it can already boast 1000+ unique visitors per day. So - and you have to imagine the Self Help Collective website is a person now - it likes to think that it knows a thing or two about success. And that's why I let SelfHelpCollective.com have its say now. at night and in between does what he wants to do." before work is in the dictionary." Learn more about the principles here! Learn more about the secrets here! Learn more about the laws here! But always be prepared to learn more - whether you have to pay for the information, or whether it's free. And, of course, what good would knowing the recipe for success if you didn't take appropriate action, if you didn't have the right motivation? Learn more about the recipe here! And don't forget learning, and continuing to learn. The success-seeker would need to read lots and lots of articles. Wouldn't they? And then, well what if victory was near? What would that feel like? SelfHelpCollective.com thinks that some people might be frightened away from it, might have a fear of success of success. That, after reading all these up-beat tips and articles on this subject some people might still try and sabotage their efforts, might still try to fail. Learn more about this fear here! And then again, some might think it funny that a website could have an opinion about 'success' or any other self-help subject. And, in that case, I would hurriedly say, "I couldn't possibly comment!" Share this suc-cess page - thanks!